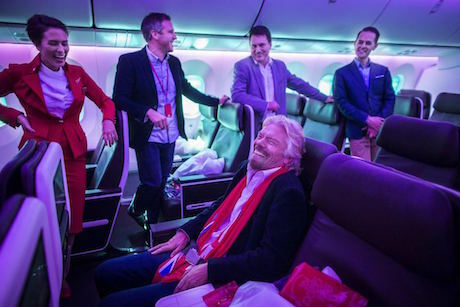 As fun-loving airline Virgin Atlantic celebrates its 30th birthday, it has been reflecting on its strengths and what makes the brand so popular. The answer is simple: its people. As Virgin looks to the next 30 years, it has put its staff at the heart of its end-to-end passenger experience, as reflected in the design of Birthday Girl, the first of its 16 Boeing 787-900s. There are many product innovations onboard, all geared toward showcasing the crew and maximizing their interactions with customers. To emphasize the point, fashion designer Dame Vivienne Westwood, known for her bold and daring style, which flatters and celebrates the human form, was brought in to design new uniforms. With the female crew in scarlet outfits with pinched waists and high collars, and the males in sharp burgundy suits with contrasting gray waistcoats, there is no denying they look glamorous. So glamorous, in fact, that the crew are the focal point of the Dreamliner interior, which has been designed to act as a sophisticated backdrop to the service. Stock pictures of Virgin Atlantic 787-9 aircraft Birthday Girl. The first impression for every passenger as they board through Door 2 is the bar in the Upper Class cabin. 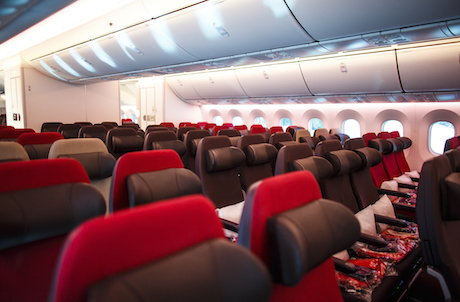 In contrast with the bar in the A330, with its red ‘jetstream’ pattern and chrome helix stools – which perhaps stole a little too much of the limelight – the B787 bar design is more subdued, with monochrome tones letting it perform as a frame for the crew standing behind and the cabin beyond. 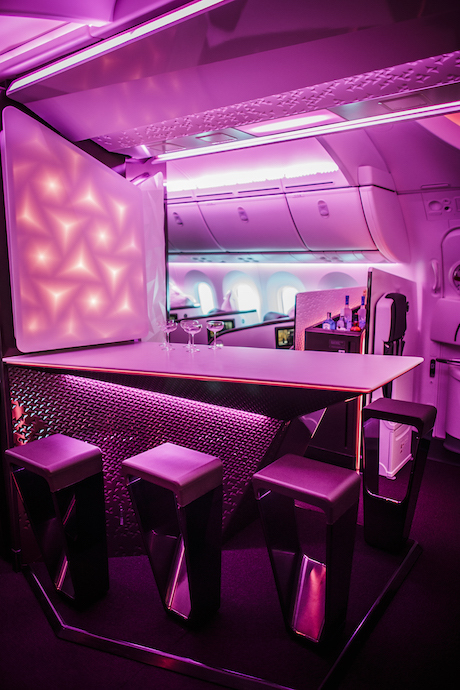 Everything in the area is bespoke, including the bar unit, bar stools, decorative ceiling features, stowages and closets, and is the result of a design collaboration between Virgin Atlantic’s in-house team and Viewport Studio, with the manufacturing undertaken by Altitude. 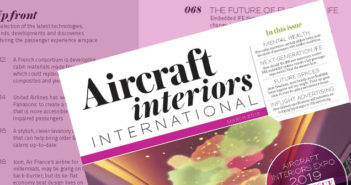 The airline felt that its previous onboard bar designs weren’t working hard enough to justify their real estate, so the design began with a brief that the space has to work effectively as a multifunctional social space throughout a flight. Thus the area features four bar stools, as well as a perch on the bulkhead wall and a lean-to, so eight passengers can enjoy the space. The design team’s love of furniture shows in the bar stools, which have been designed to be of a style and quality that would meet the standards of any high-end furniture store – indeed the pared-back styling and palette meant that every detail of the bar had to be considered and executed to a higher standard than with previous projects. The bar has a monolithic, architectural style, with the lower part clad in a dark finish so that the eye is drawn to the cantilevered white Corian bar surface – the space where the atmosphere is created and where guests mix with crew. An exciting part of the bar design is the textured back-lit paneling, manufactured from Corian with geometric star and diamond shapes milled down to such a fine gauge that light can show through them. This isn’t just a static backlit installation, as LEDs installed behind are programmed to make the panels into living, moving surfaces. We’ll come back to the lighting in a moment, but those geometric shapes are important, and are an element used in the Clubhouses, now being carried throughout the Dreamliner, from the bar and bulkhead decorative panels, to the thermoplastics for the bar units, bottle racks and ceiling panels – at various scales, from macro to micro. To manufacture all the panels with their irregular patterns as individual projects would involve huge tooling and production costs, but Viewport came up with a clever solution. 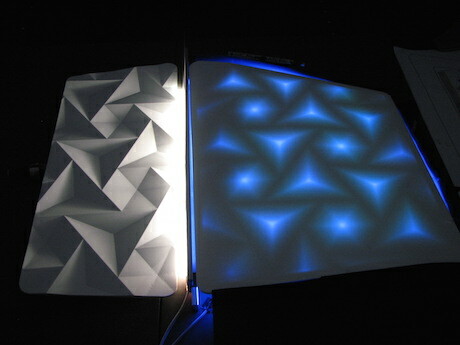 The studio worked out how large a sheet of vacuum-formed Kydex would have to be in order to include all the patterns needed, and then created a tool around 2.5m x 1.5m in size to form them. This means that only one piece of tooling is required to form all the necessary parts, which are then cut out and sprayed in different finishes. “From an efficiency point of view, we invested the minimum amount for the biggest bang. It’s about being clever, not necessarily spending more. It’s about finding ways to be different through intelligence and technology and manufacturing skills, though finding someone to build a tool that large wasn’t easy,” explains Viewport designer Gareth Southall. The bar looks amazing – and another amazing thing is that Altitude completed the project in just 18 months. 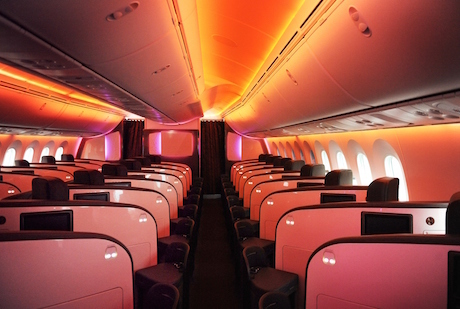 The more understated cabin palette has also enabled the design team to be a little playful with the B787’s full RGBW LED mood lighting system. The design teams worked closely with Boeing and Diehl Aerospace to develop the lighting systems and the various mood scenarios. However, they went a step further and convinced Diehl to develop 8in-long, individually programmable segments for use in the bar units and the decorative panels. The smaller lights work in tandem with the main cabin lighting, so they can be actuated together via a control panel by the crew, who also helped to develop the preset scenarios, including a soft ‘rose champagne’ for a relaxed feel during boarding, ‘purple haze’ for inflight comfort, ‘amber warmth’ for a candlelit dining effect and ‘silver moonlight’ for sleeping under the stars. The team is also working on route-specific scenarios, to set the right mood for flying to the Maldives or Las Vegas, or a red-eye from New York, for example. Diehl developed new software specifically to support the development of this lighting system, which may find its way into the B787 catalog as there is a tripartite agreement between Diehl, Virgin Atlantic and Boeing to develop the system to have more capability from a programming point of view. 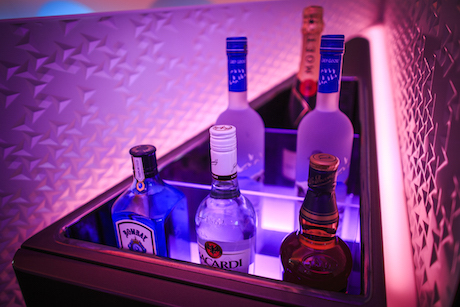 The teams made good use of Diehl’s full-size B787 lighting rig in Nuremberg – Boeing only has a half rig – and also Virgin Atlantic’s own mockup bar area kept near Gatwick, where it can develop new mood scenarios. 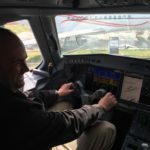 The Virgin team has two dedicated and secure Boeing laptops at their disposal, which can be used to push the data for new lighting scenarios to the aircraft in hours via wi-fi – perfect for private charters such as NFL team flights, when custom scenarios such as team colors might be wanted. Better still, rather than replacing physical hardware for a cabin refresh, Virgin’s design team can simply change seat covers and use new lighting scenarios to upgrade the interior, reducing costs through the aircraft’s lifetime. We’ve seen Upper Class evolve from the bright aubergine tones of the B747s to the darker leathers and metallics of the A330s launched in 2012. 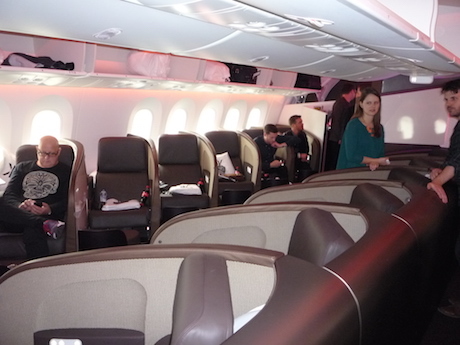 The 31-seat B787 Upper Class is subtler still; you won’t find any Swarovski in here. The new seat (named UCS3) has been designed as an evolution of the design, using the form of the first version, as found on Virgin’s B747s and A340s, with some color, trim and finish cues from the later A330 version. 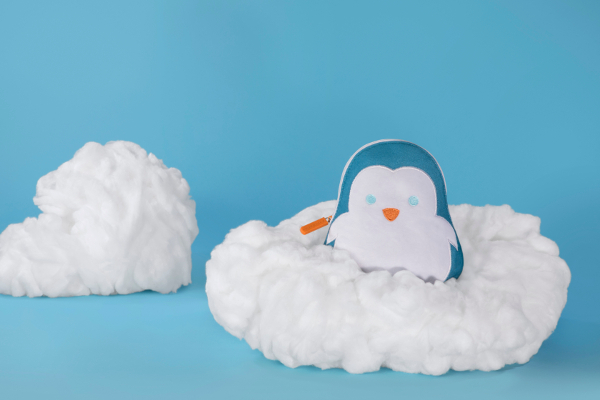 A little input also came from Air New Zealand, which uses a customized form of the seat. Thus the key features remain, including the flip-over bed, the ability to recline all the way from boarding to landing, direct aisle access and an ottoman for dual dining. However, the shields have been sculpted for a little more privacy when sleeping, the flexible LED reading light has been replaced with a flush-mounted light that pops out with the touch of a finger, and the cartridge system for the dining table has been altered to make it lighter and easier to deploy. Enhancements that fit in nicely with the B787 include switching from screw-fed motors to actuators so that the seat operation is quieter in line with the quieter aircraft experience. A few internal tweaks have also made the seat operation a little smoother, such as a small cam introduced between the headrest and seatback that smoothes the movement. The flip-over feature, as well as allowing dedicated and uncompromised sleeping and seating surfaces (which have also been upgraded by seat manufacturer Zodiac Seats, to smooth out joins), also gives passengers a chance to interact with the crew, who offer a turn-down service where they put the seat into bed mode and add a sleep sheet, duvet and pillow while you change into your pyjamas. The seat in question is the Zodiac Reverb at a 38in pitch, the same model that Virgin is already flying, but with ergonomic enhancements and slightly more recline. Passengers will enjoy the 11.1in IFE display, but they also have a new source of escape – a dedicated premium economy destination space called the Wander Wall. This is a self-serve area complete with mini-fridge and water fountain, where passengers can stretch their legs, socialize, and help themselves to snacks and refreshments. The wall is integrated into the back of the Upper Class bar unit, and really feels a part of the same product, especially with the geometric shapes being carried through into the Wander Wall finishes. As the Wander Wall is located in a galley zone, this feature does not come at the direct expense of a row of seats, but it still has to earn its keep and can hold three galley carts in the lower level, so not an inch of space is wasted. With the luxury finishes of the seats and the Wander Wall, the premium economy cabin really does feel like a product situated between economy and Upper Class, and will be aspirational for economy flyers and no hardship for Upper Class corporate regulars paying for their own vacation tickets. Think of it like the iPod and iPod Nano – it is not a lesser-quality product, just a product for different needs. The Recaro 3620 seat was selected for the 198-seat economy cabin, at a 31in pitch. 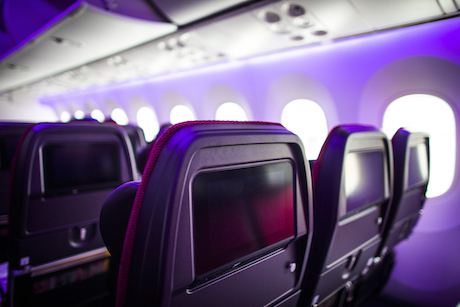 The seat was chosen for its knee room, comfort and ergonomics, according to Virgin Atlantic, and all seats have been fitted with Recaro’s adjustable ‘hammock’ type headrest, as well as a flush-mounted 9in eX3 monitor, USB port and access to power. 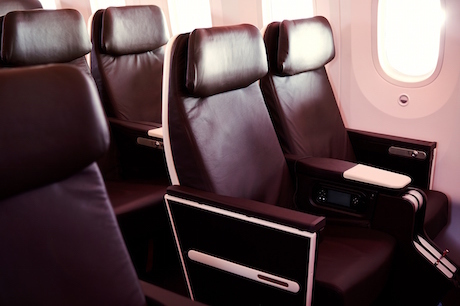 The seatbacks are finished in black cherry, which is surprisingly dark for the economy cabin, but the design team say that the color adds a sense of sophistication and is made possible because the mood lighting lifts the cabin. 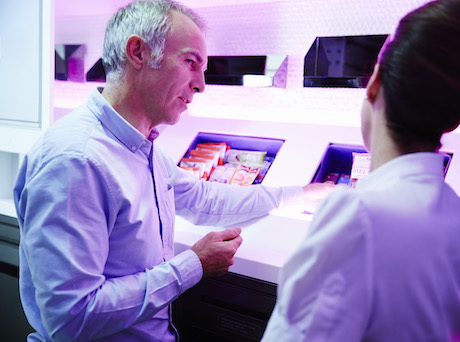 Fixed shell seating was not considered, as the Virgin Atlantic team have not found current options to be sufficiently comfortable for long-haul flights, though they do like the product as a short-haul proposition. 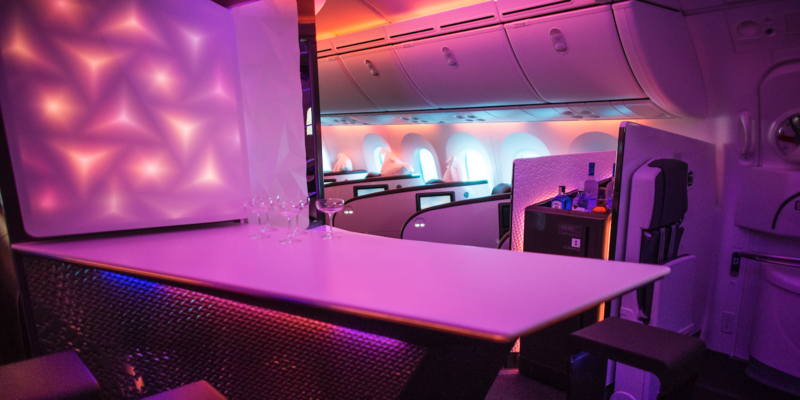 With a more conservative approach to the color, trim and finish for the Dreamliner, and with LED lighting creating new effects, the Virgin Atlantic design team had to create a real depth of quality and intrigue in the new cabins. A new finish found on the Upper Class Suite shields is a ‘geisha-white’ paint with a mica finish, which ties in with the paint finish on the B787 livery. Rather than having red in the CMF to reflect the Virgin brand, this subtle approach is believed to be better. “You already know you’re in a Virgin aircraft, so we chose to let customers experience the brand on a more subliminal level,” says Nik Lusardi, the airline’s design manager for customer experience. In some lights the finish looks flat, but as sunlight and mood light moves across it, the surfaces shimmer. The leathers on the Upper Class seat surface and armrests are espresso-colored, complemented by a black-cherry leather on the ottoman. While the leathers are dark, the space does not feel dark, with that mica white shield to the left and a bespoke 3D fabric in gold to the right, which also ties in with the A330 palette. The textile has a hexagonal 3D weave and is also used on the bed surface. A nice touch is that the economy seats also have a hexagonal textile, used on a slightly larger scale, with red on the outboard triples and espresso in the middle (well, there had to be some red), gold on the extra legroom seats, and all with espresso leather headrests. The black-cherry seatbacks also tie in with the ottoman color in Upper Class. The premium economy seats are also clad in espresso leather with geisha-white seatbacks, so there is a design narrative running throughout the forms and textures of the entire aircraft, from front to rear. 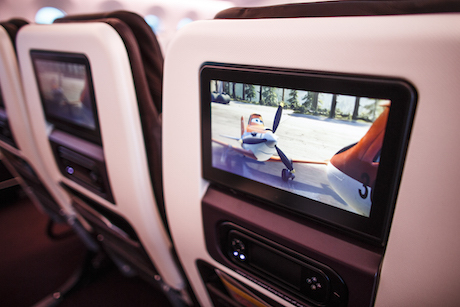 Virgin Atlantic specified Panasonic’s eX3 IFE system, with Android running on a QT engine. There are widescreen capacitive touchscreen smart monitors at every seat, with 11.1in displays in Upper Class and premium economy, and 9in in economy, with the bar area having a 24in touchscreen monitor. Named Vera Touch 2, the system features a simple intuitive GUI that allows passengers to swipe and scroll through movies, TV shows, music and games to select what they want to watch (there are over 400 hours of entertainment), with closed captions as an option. All seats also have an integrated USB port to upload and view photos and audio files, as well as access to power. The IFE system also runs the Skymap 3D moving-map system from Betria Interactive, which shows flight data and progress, plus high-resolution 3D views of the destinations and various viewpoints from the aircraft. Passengers can also check out where they are in the journey by viewing the flight tracker bar on the main menu. Virgin Atlantic has also teamed up with Panasonic and T-Mobile to offer eXConnect Ku-band wi-fi connectivity onboard the B787. Customers can connect their devices to the wireless onboard internet service for £14.99 (US$24) for the duration of the flight, though they can browse destination and aircraft information, inflight shopping and further Virgin Atlantic services for free.